If you grew up watching Free Willy and then were shocked upon entering SeaWorld to find that his brethren continued to suffer among throngs of vacationers at the company's amusement parks, today is a good day. SeaWorld will end its orca whale breeding program, the company announced Thursday. The current orcas, or killer whales, will be the last to live in captivity in the parks. SeaWorld will stop breeding them immediately and continue with plans to phase out the live orca shows. SeaWorld has not captured an orca in the wild in nearly 40 years. Most of the company's 29 killer whales were therefore born and bred in captivity. They will not be released. "For as long as they live, the orcas at SeaWorld will stay in our parks," Joel Manby, the president and CEO of SeaWorld wrote in an op-ed in the Los Angeles Times. According to the piece, that's not to profit but to keep the whales safe. He added that they will receive top medical care with the latest advances in marine veterinary medicine. Currently the orca shows are the centerpiece of the park experience at the group's locations in California, Florida, and Texas. Long a target of animal rights groups, the SeaWorld orca progam came under closer scrutiny after the death in 2010 of a whale trainer. Dawn Brancheau was killed by Tilikum, a killer whale that was then featured in Blackfish, a 2013 documentary about SeaWorld's treatment of orcas. The director, Gabriela Cowperthwaite called the announcement a "truly meaningful change." Manby attempted to explain some good that has come from the company's years of orca-based entertainment. He wrote before the parks opened in the 1960s that orcas were feared instead of loved — hence the name "killer whale." Only through exposure to the mammals at places like SeaWorld have they become an animal that so many would want to protect, he said. As for releasing the remaining orcas into the wild, Manby pointed to the story of Keiko, the orca from the movie Free Willy. 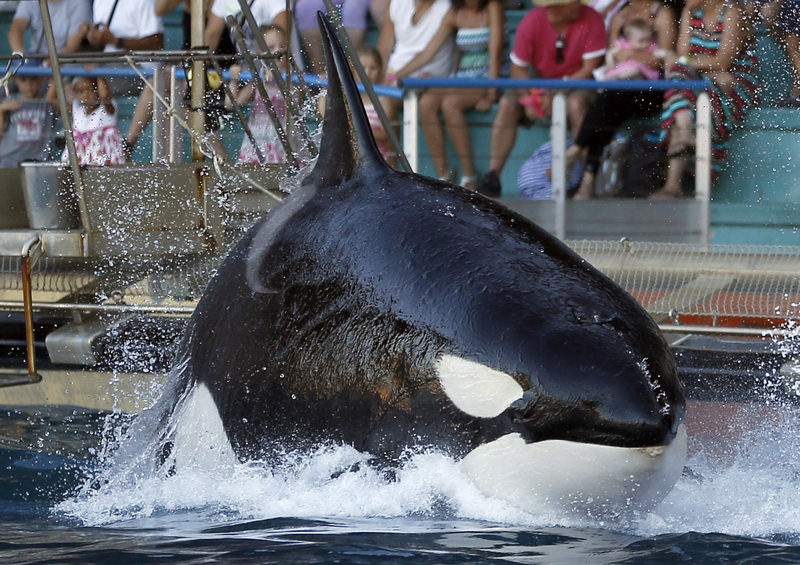 Keiko was born in the wild, and after the success of the movie, attempts were made to free him from a dingy tank in Mexico City, where he did shows at an amusement park. Eventually enough money was raised and he was released in Iceland with a tracker. He swam all the way to Norway, but within the year he contracted pneumonia and died. He was never truly independent; a team from the Humane Society of the United States was still regularly feeding him the 110 pounds of fish that he needed each day. The policy was developed with the help of the Humane Society of the United States, which lauded the project — after having "clashed with SeaWorld for more than two decades," as HSUS put it. As a part of the announcement SeaWorld has said it will increase its focus on rescue operations. Manby said animals in danger will now have another option. "Thousands of stranded marine mammals like dolphins and sea lions that cannot be released back to the wild will have a place to go," he said. As for the live orca shows, they are being phased out this year in San Diego. As part of a plan that was announced in November, the new show, which will begin in 2017, will focus on orcas' natural behaviors and include messages about conservation and how to protect orcas in the wild. The phase out will take longer at its other parks, with San Antonio and Orlando stopping their theatrical orca shows in 2019.